Chelsea are reportedly continuing contract talks with David Luiz, who has turned down a lucrative deal to head to the Middle East at the end of the season. The Brazil international has just three months remaining on his contract and so far, he has failed to agree on an extension with the Blues reluctant to offer him with a multi-year deal. Amidst this, the central defender is said to have received a £220,000-a-week package from an unnamed Qatari club, but he has snubbed the advances with the objective of remaining with the Blues. 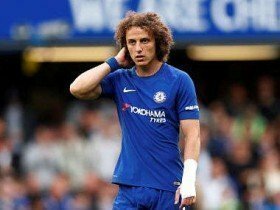 Luiz is presently on a £130,000-a-week salary at Chelsea and he is hopeful of earning at least a two-year contract despite the club's shrewd policy of handing 12-month deals to players above the age of 30. The 32-year-old has made almost 250 appearances for Chelsea across two spells with the club. He has won five major honours in the process including the Champions League title in 2012.